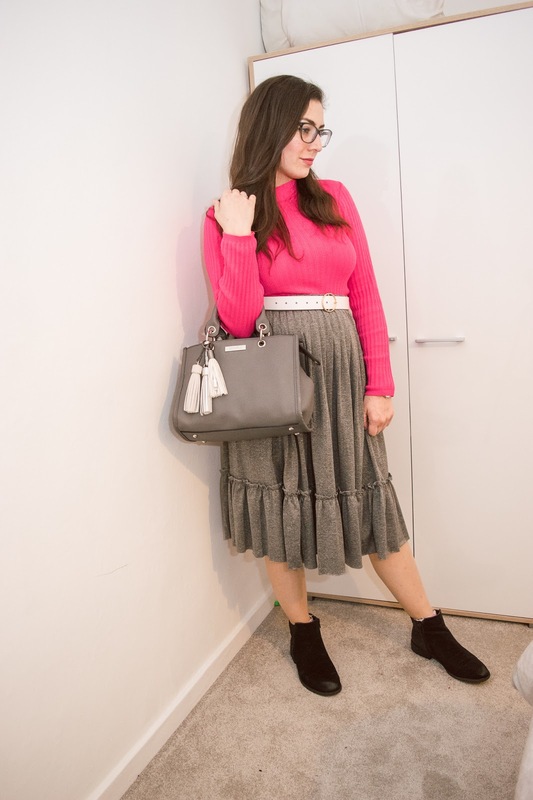 Another mid-week outfit and the forth style post of 2019. It's sad to say but at this point I've already uploaded half the amount of outfit posts I uploaded all of last year. Last year I totalled just nine style posts. That's it. It was awful. But I'll spare explaining why (yet again). This year, I'm already excited about style and motivated to post more! I feel like I'm already committing to uploading more and I feel a little bit like a blogger again. It's interesting being a blogger, but even more so, a 'small blogger'. I always wondered if I would try and make my blog bigger than this, but I never put the effort in to push it into something more. I don't think I ever wanted to. I also wonder what I'm doing blogging and Instagramming these days if I don't want to push it to be big. Do I want it to grow? Am I happy with being a small blogger? The thing is, I want both. I'm not looking to be 'Little Miss Hot-Shot Successful Blogger' but I also don't want to stay being what feels like a teeny tiny blogging platform. I want it to feel like it has a purpose in the blogging community. I'll be honest with you, what I really want is: the readers, engagement, small-time success, purpose and amazing opportunities without the "fame". And by fame I mean, I don't want to be a 'big blogger' who has a well-known online presence and makes a business out of blogging. I don't want to be a full time blogger or anything close but I love blogging. I want it to be seen, I want to have fabulous opportunities to work with brands but I want to also maintain a life separate to it all. I absolutely adore my job and I never want it to ever intertwine with my blogging. Some of you might think it's silly and it's a strange concept but it's exactly how I feel. I wonder if any of you feel the same way? We've gone entirely off topic, but do you know what? I'm keeping that there because it's a discussion worth having if you're interested. A bit like my previous outfit post, this outfit has been inspired by my favourite bloggers and Instagrammers. 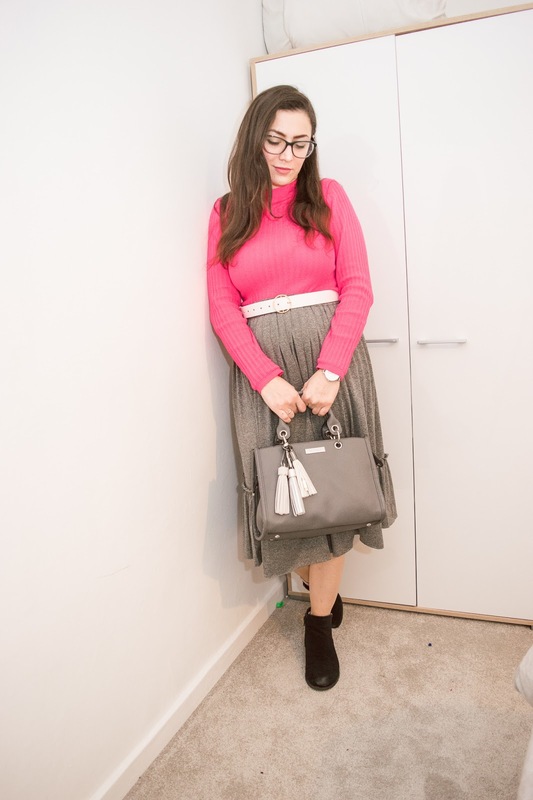 I'm a big fan of midi-skirts and I received this one when I collaborated with Simply Be around this time last year. I styled this skirt in a similar way actually but with more of a 'rock-chic' look. That's what I called it back then at least. This time, I have a work-wear twist on it and it's more suitable for the office or a day out. I paired the midi with a new neon pink top from Primark. I adore this colour and love that neon colours seem to be an upcoming trend. I bought it last month with an aim to buy a few tops like this in a few colours. Back in October I bought a grey and a black ribbed light knit top like this that I wear a lot and it seems the other colours that were available back then are no where to be found. I was gutted, but I did find this which was similar, but with a different material and a higher neck. I really like it and I've been getting a lot of use out of it too. This style of top work with a lot of things I already have and fit my style at the moment. They're also really warm too which is important to me. I get cold really quickly and it's nice to have a thick top without a jumper sometimes. It's amazing when you find something you really like that's available in lots of colours. It almost becomes a must-have. Tops like this and basic tees are my must-haves but if I find a style of denim that really works for me, I like to get that in more than one colour too. For me it's the Miss Selfridge Steffi jeans. High waisted beauts with a variety of colours and a soft stretchy fit! I've loved them for years. What's your must-have in more than one colour? This post features gifted products.